last month of the year...it's been a year for buying and selling, but now this year is coming to a close. and I have it today which is funny, but it is as clean as the pic, it is a cheapie for sure. looks like a factory highstring setup all saddles inline as in someone bought it and said #### it and threw it in the closet. thing has just a little neckdive but nothing unreasonable with a brass nut. pickups are true dualcoils and huge housings that look like they could easily handle 6 strings with full sized smooth pots. tuners that feel like the gears are grinding inside the little housings and 100% will be replaced. the pickups although quiet are VERY LOW GAIN and yes it could be to the string height to pickup ratio but no matter because it will be MR MING'ED this weekend. there is plenty of grain marks when you hold it to the light. and now to the luthiers section....hey mike WTH is this a cap om the thing. I tool the cover off to see the wiring and it's got a split inside that bevels down with the countoured top..they glued a piece on a flat top?..so weird to see if that's the case the thing is a lot thinner overall than my charvels are..
when i take pics of it tonight i'll show you what I mean. I think I know what you mean ... but ide like to see the picture anyhow. Like you said ... its a cheapie. True contour top instruments (solid body) are carved from a solid one piece, top and bottom wings or carved with a veneer (bent to the contour) on top. I think what you got is the "contour" or "arch top" is a veneer. Schecter and dean do this. Archtop at an affordable price. Still ... this is a pretty cool bass. Nice score. Knobs mounted flush to the angle of the top sand not flat ... you can smell the cheap! Truth is ... most people don't notice details like that ... or care. And yes ... ide rather have a flattop as well. I just erased the whole post. well gang, if I said I was done for the month...uh, I was wrong. 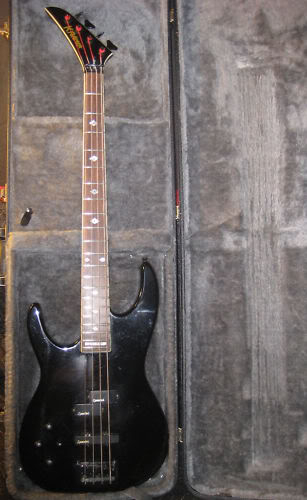 I sold my Convert-V off to buy a rare LEFTY Spector/Kramer Forum3, just like my right handed one I had for a while. I got 5 bills for the Concert and the Forum was 3 so I still am ahead of the game. Like the old saying goes Mike, "the one who dies with the most toys wins"! I thought it was "the one who dies with the most toys will have enough for the estate to sell for funeral expenses"
The Concert was valuable, but not "rare" so I'm not bumming about losing it...they are expensive, yes.... but available. but the Kramer may not be as valuable, but it is MUCH rarer and the chances of finding another one are VERY slim to none.!! !